Granite countertops are the best bet for your kitchen. It is the most widely used stone when it comes to kitchen countertops. They give you richness and depth that has not other match. When you choose a granite countertop, you give yourself a kitchen that will last you for a lifetime. The granite looks good; they are very strong they can be customized to your liking and provide you years of service. However, they do require maintenance from time to time. The biggest advantage of granite is that they are really easy to maintain and they do not require any special attention to take care of them. By following few steps, your countertops will have a brand new shining and appearance. The best way to have sparkling clean granite is to clean it on daily basis. Cleaning the granite top is not much of a process and can be done by using regular water and the liquid detergent that you use in you kitchen. As granite is resistant to stains, you don’t have to worry about any marks on the surface of it. After cleaning the stone with water or soap, the surface of the granite will have an automatic shine. If you have a countertop that has a polished mirror finish, then it will instantly shine even if you will clean it with just the water. The shining surface of the granite prevents any water marks and even if you have calcium deposit stains on the top of the stone, they can be cleaned using the tap water. 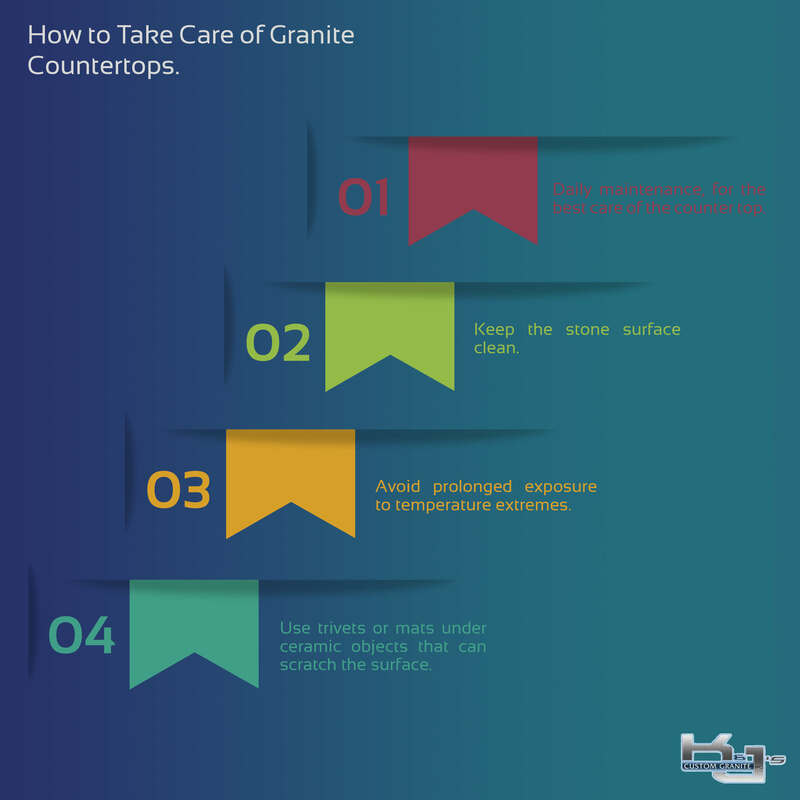 Though the granite is heat resistant, it is advisable to protect it from long exposure to high temperature. You can keep a hot vessel directly over it for a time being but you need to use a stand if you plan to keep it for longer duration of time. However, if your kitchen gets the sun rays for a particular time period in a day on the granite countertop, you need not to worry about it. If you have sharp objects in the kitchen then you need to be little careful. Thought the granite stone is hard enough to avoid any scratches on the top surface, but if you have a polished mirror finish, and then it might attract some scratches if you are not careful with some utensils. It is advisable to use trivets and mats under the ceramic objects that your use in the kitchen. Often time we tend to drag the utensils on the top of the countertop and though they don’t look at first, but it tends to mark vertical lines on the surface of the granite. The mirror finish granite with those fine scratches will look really bad when you will put on the lights. So to avoid it, use mats beneath the utensils that may put a scratch on the surface of the stone.